Greetings from the Highlands of Guatemala….wish you were here! Photo taken outside of Zunil, Guatemala, in the mountains. If you haven’t noticed by now, I adore flowers. Their incredible beauty always inspires me and warms my soul. I found this pretty flower up in the mountains near Zunil. I thought it was so creamy white and pure. The elevation is high and I am not sure what kind of flower this is. But it sure is lovely. 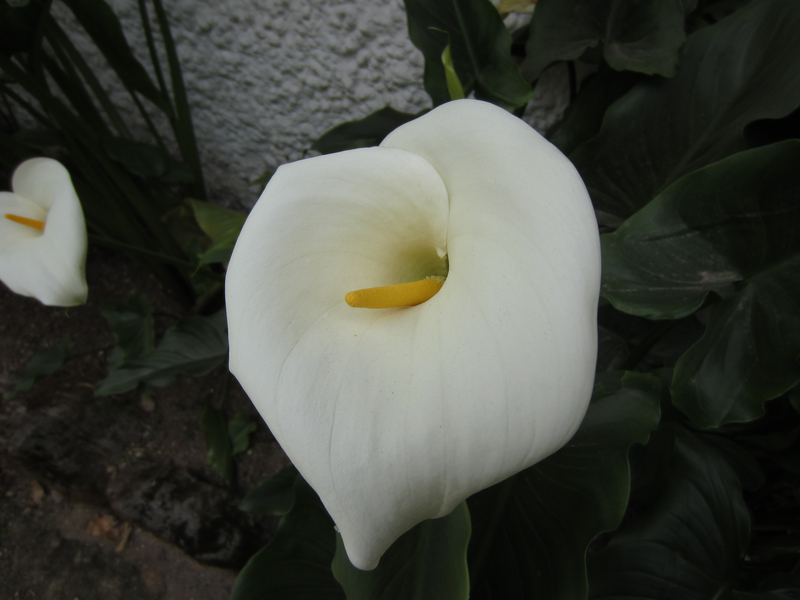 I didn’t realize it grew so high in the mountains, but I shouldn’t be surprised that the calla, or arum lily (botanical name unpronounceable, for me) where it would be found growing wild, given its wide geographic spread, fro the Americas, to Africa. It must have been magnificent, and sp surprising, to see that pristine white flower thrust up above the soil. Lucky you. Thanks! I thought it was some kind of lily. I’m trying to learn more of my flower and plant names, especially since I like them so much! I actually saw this lily at the hot springs where it was quite tropical in flora and fauna but quite high in altitude and cold. Strange, huh?